Other than food, coffee may be the thing I care about the most on a day-to-day basis. My criteria for ranking these coffee shops take into account: quality of beans and brewing processes, espresso beverage options, alternative “milk” options, good non-coffee options (tea, juices, alcohol, tonics etc. ), food menu, value for price, and of course, style. I’ve recently updated the list to include potential “drawbacks” as well. Merchants of Green Coffee (Restoration Cafe): I’ve had their coffee many times over the years, but it was only after I visited their Restoration Cafe headquarters that I truly understood the unique, mission-driven brand. On your first visit, order a cup of freshly ground, individually-made coffee before you order an espresso beverage. It may be the best cup you’ve ever had. Potential drawback: Their warehouse location is cool, but in an awkward location. Boxcar Social: This place epitomizes Toronto and its strong coffee scene. 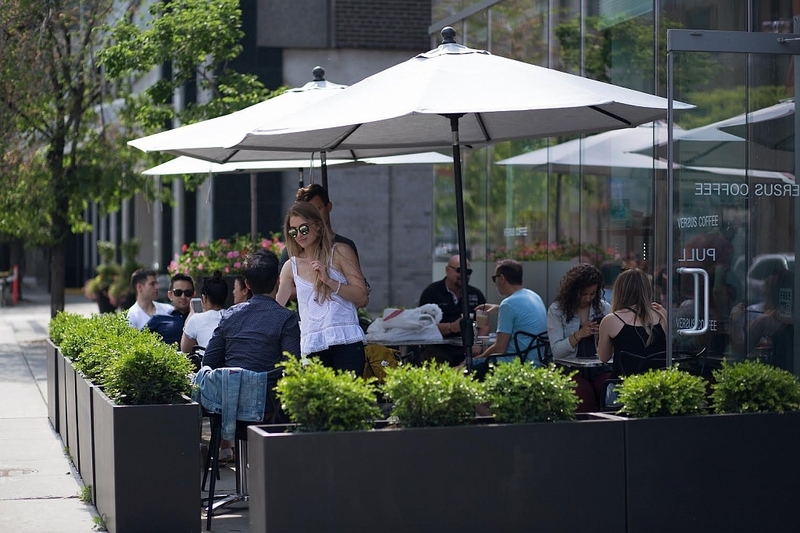 With locations in Rosedale, Temperance Street and Harbourfront, they have overhauled and significantly improved every space they take over. They are fully licensed and even have charcuterie board options as well. Potential drawback: some of their staff are a little bit too obsessed with the way a bean touches the water. Neo Coffee Bar: This Old Town Japanese coffee shop is a beautiful and slick place to go to read your Monocle or Walrus magazine in your raw silk pants and fancy glasses. Potential drawback: they expressly prefer people to come and chat with their friends or read a book rather than camp out to work on their thesis. Te Aro (Pilot Coffee Roasters): You can find Pilot Coffee in various locations now, but Te Aro in Leslieville is still the heart of the operation (in my opinion). Potential drawback: it’s hard to keep track of where each location is, and what they each offer (I know I’m really grasping at straws). Fahrenheit Coffee: The staff here are so friendly, you might think that there’s a little something-something in the coffee (or their addictive scones). But as you’ll soon learn, it’s just a really happy place with really great beans. Potential drawback: there’s very little seating here. De Mello Palheta: This is the place I usually stop in when I’m in the Yonge and Eglinton area. They also have umbrellas all over the ceiling, and an obsession with their brewing process. Potential drawback: the walk down the stairs to the bathroom is treacherous for tall people. Sam James Coffee Bar: It’s a straightforward and almost identical operation at each of their locations with a stripped down brand that’s all about the brew. I used to go to the one in the PATH on an almost daily basis for a Flat White with my Aussie friend Cindy. Potential drawback: cash and debit only for all locations. Balzac’s Coffee: If it weren’t for Balzac’s coffee and warming winter tonics, I would have never made it through law school. They try to maintain good community vibes with initiative such as encouraging you to bring your own packed lunch to eat within if you like. Potential drawback: They have been so successful that it sometimes feels like they’ve lost their “independent coffee shop” touch. Jimmy’s Coffee: If you can handle the overly friendly vibes, you’re going to like it here. Many Torontonians are fiercely defensive of this coffee franchise. Potential drawback: the seating is awkward and you may have to fight for it. Rooster Coffee House: With Persian rugs and various kinds of seating, this place is one of the best to hit up on King East, and their baked goods selection is totally over the top. Potential drawback: it’s pretty loud here, especially if you run into a Chatty Cathy beside you. Bulldog Coffee (Assembly Chef’s Food Hall): A consistently good quality cup and a must-stop after eating anything else in the food hall. Potential drawback: The coffee shop shares a large space with the rest of the food vendors, which cannot be controlled. FIKA Cafe: this Kensington spot has pretty good coffee, but the Scandinavian hygge is really why I’ll keep coming back. Potential drawback: this cafe is not wheelchair accessible whatsoever. Green Beanery: As the first thing you see coming out of Bathurst Station, this is a popular meeting spot. They are unique in that they roast all their own beans on site (currently 100 beans and six roasts), and have both a gift shop and this crazy vault meeting room that can be booked for a price. Potential drawback: no wifi, and their food options are fine, but quite amateur in quality. Cafe Panemar: An old favourite of mine in Kensington Market, especially for their patio in the summer. They also host events at night. Potential drawback: the narrow space design can be a bit claustrophobic, especially in the winter. Dark Horse Espresso Bar: A long-time favourite back when coffee culture in Toronto was still considered an up-and-coming thing. The Spadina location is my favourite. Potential drawback: some of the locations are way too dark to read or work in. R2 (Rsquared) Coffee: This place makes one of my favourite cappuccinos, and it’s a great place to rest up when you’re taking a break from shopping on Queen West. Potential drawback: You can never tell which of the gaggle of individuals near the front are staff, and which are patrons. The Common: This coffee shop (one on College, and on on Bloor) is so unpretentious and so casual, you might think that they’re putting on an act, but I’m (pretty) sure they’re not. Potential drawback: Cash only, and an occasional and mildly judgmental attitude towards non-regulars. Manic Coffee: This place is usually filled with the University of Toronto crowd, and is designed to be a quiet, thoughtful spot, with a few extras, but nothing extraordinary. Potential drawback: They don’t have wifi, and are insanely proud of it. Early Bird Coffee and Kitchen: You’ll love this Queen Street spot if you’re a Millenial Influencer. There’s also a new location in the PATH at Brookfield Place. Potential drawback: You’re likely to run into Millenial Influencers. Odin Cafe + Bar: A sister establishment to Thor Espresso Bar, this is a very stylish East End spot with amazing reading material to keep you dreaming about your next travel adventure for hours. Potential drawback: they have fairly good food but it’s a shame that they can only heat it with their microwaves. Versus Coffee: This fairly new coffee shop has a great patio and a fun vibe near the Financial District. Potential drawback: the tables are all quite small and a little unstable, which can make it difficult to balance your drink and/or book and/or laptop.